After an unnerving bout of “inside cabin” cruise ship claustrophobia over a decade ago I decided to remain on land. But since then the industry has evolved dramatically as a major travel trendsetter with energy-saving hulls, Vegas-at-Sea theaters, flashy casinos, dashing European-style restaurants, and four-star deluxe accommodations. With chic cabins and comfy verandas for intimate relaxation, you can luxuriate in the soft morning sunlight and take a full breakfast fit for a pasha on a deck chair outside invigorated by the bracing sea air. Additionally, as the economy improves, a travel product that includes transportation, security, taxes, room and board, entertainment, and exotic ports of call for a per diem as low as $150 per person, double occupancy, for a veranda stateroom on a seven-night Caribbean cruise appears practically unbeatable. 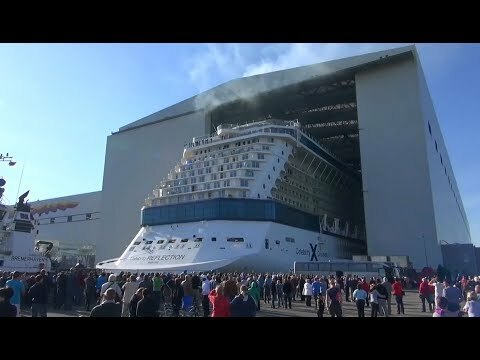 The Celebrity Reflection’s spatial configuration sports elegant, sinuous lines with two exhaust funnels instead of the traditional single stack, an efficient curved high bow, and a ducktail-designed stern with “interceptor,” all contributing for smoother sailing and fuel economy. An imaginative idea for the upper deck is their Lawn Club on Deck 15, a half-acre of “Creeping Bent” (Agrostis Stolonifera) grass with an automated subsurface drip irrigation system over four miles long. From the verdant expanse sprouts a putting course, bocce, quoits or ring toss, croquet, eight cabana-style Wi-Fi retreats or Alcoves, giant Adirondack chairs, and two surcharge specialty restaurants, The Porch (casual) and The Lawn Club Grill where diners can assist in prepping pizzas and grilling their own steaks. During our last night celebrity chef Jeff McInnis of South Beach’s Yardbird Southern Table and Bar happily raised caloric levels with buttermilk biscuits and cornbread, wild boar jerky on a charcuterie board, a humongous tomahawk rib eye carved tableside, shrimp n’ grits, truffle mash, sautéed butter beans, Mississippi mud pie and a Big Ol’ Waffle decked in bourbon maple syrup, buttermilk ice cream, toasted pecans, and, naturally, candied bacon! My outside cabin in AquaClass was a cocoon of comfort minutes away from the beehive of activities aboard. I slept like a baby in my eXhale bedding within my 194 sq. ft. stateroom while a sliding glass door connected to the 54 sq. ft. veranda and its two reclining deck chairs and table, the perfect location for reading or gazing at a sunset. The handsome room shouts ergonomic flair with its blonde modular furniture, subtle curves, plush rounded-cornered queen bedding and multiple pillows, and 32-inch flat-panel Samsung TV featuring music selections, previews, room service ordering, and photo and shore excursion purchases. Not surprisingly, the bathroom hints at spa features like the Hansgrohe Comfort Plus showerhead and jetted body wash, a convenient shaving foot rail in the shower, and fog-free mirror. In the 152 double occupancy AquaClass forward staterooms on Deck 11, guests have free access to the AquaSpa relaxation room and Persian Garden, complimentary dining in Blu, an upgraded room service menu, and continental breakfast at Blu from 7-9 am. (At lunch in Blu I enjoyed excellent seared scallops, a roasted filet mignon with fingerling potatoes, and a chocolate Valrhona cake with white coffee ice cream.) AquaSpa by Elemis, located on the bow, plays with the theme of Greek Islands like Mykonos and displays deep blue and muted white tones. Treatments range from a herbal poultice massage that applies special oils to joints and muscles to their “24-Karat Gold Facial” that combines medicinal plants, Rose Quartz, and a 24-k gold leaf mask for a rebalanced complexion and clarified skin texture. Besides botox treatment, acupuncture, teeth whitening, cellulite reduction, and personal fitness training, there’s even a “lash and brow bar” to enhance and highlight facial features.